Since the discovery radiation from the Fukushima reactors in Will County, Bolingbrook officials are secretly reviewing their plans to deal with a giant monster attack. Dockman says Bolingbrook’s plans have improved since 1971. Then, Bolingbrook planed to fend off a “Godzilla-style” attack by putting a bunch of school children in its path, and hoping that they would charm the creature into leaving Bolingbrook alone. John Gayles, also on the committee, says Bolingbrook’s current policy needs to be revised. Both men want to change the policy to drive any monsters to the Elmhurst-Chicago Stone company quarry, and then drop heavy bombs on it. While bombing the location could actually help the company in the long run, there are protests against the policy. 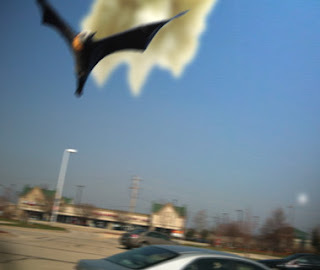 Claar, according to Gayles, is also concerned that Bolingbrook homeowners are not insured against giant monster attacks. Bolingbrook officials are hoping that Naperville will pay for the monster coverage. While both men agree that there is a sense of urgency, they realize that things could have been worse. “The voters could have elected Bob Bowen, and I’m sure he would have insisted on feeding Roger to the monster." Some scientists insist that there is no danger from giant monster attacks. Donna Swanson, a biologist and computer programer at the University of Washington, made some unprintable comments when asked. When reached for comment, Claar seemed unconcerned about the risk of a giant monster attack. The $5 Dollar Challenge upgrades to the JREF! Web Exclusive: Bob Bowen speaks! Web Exclusive: Joe Naponiello responds!